Artistic & Musical Director and Choreographer Ted Zdybal has been working with The White Eagle Polish Song and Dance Ensemble since 1996. He has created several full-length works The Four Seasons, Our Pole Our Poland and created many choreographic works for the Ensemble. Under his Artistic Leadership the Ensemble has traveled to Europe, Asia, South America, Central America, The Carrabian and throughout the United States and Canada. As a producer, the Ensemble has several Professional Audio and Video Recordings. 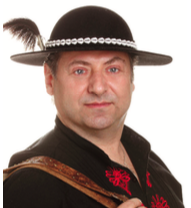 Mr. Zdybal is a former professional dancer with the Polish national Folk company Slask and is the first ever Canadian to ever perform with the company. Prior to his career in Poland to he performed for several years with Het International Folkloristisch Danstheater in Amsterdam, Holland. This professional folk ensemble had a repertoire of international folklore. While in Poland he was the Artistic Director of Tarnogorzanie of Tarnowskie Gory Poland. He has taught for and choreographies for many folk ensembles in Poland, Russia, Holland, Belgium, The United States, Canada and Taiwan. Ted Zdybal received his professional training from the prestigious National Ballet school of Canada Teacher Training Programme, The Toronto High School for the Performing Arts. He graduated with honours from The Choreographic Institute Poland at the University of Marie Curie-Skladowska as well Royal Conservatory of Music and the United Conservatory of Music. He has been awarded the internationally acclaimed Order of The Smile, Golden Cross of Poland, The Citizenship Award. His choreographies have been awarded The Golden Ciupaga / Highlander Axe and the Prestigious Folk Festival in Zakopane, Poland, First Place in Olkusz, Poland, Second and Third Prizes and the International Chin Picnic. He has played an active role as a member of the Board of Directors for Folklore Canada and The Community Folk Arts Council of Metropolitan Toronto. Since 1996 Artistic Director Ted Zdybał has brought the ensemble into a new technical and creative era. With the same values as its founders, he has instilled in the youth a dedication to the professional interpretation, presentation and expression of historical and contemporary Polish cultural traditions and values. The ensemble is comprised of individuals who devote themselves to the cultivation of their ancestors’ folk culture through song and dance. Notable mention can be given to the ensemble’s philosophy of not only entertaining but also educating audiences and dancers alike. Most recently, the ensemble’s Artistic Director has taken on the task of researching, exploring, collecting and staging folklore from “unknown” Polish sub-regions in which ethnographically, people differentiate themselves. Strong emphasis is made to the commitment of discovering our roots by creating a new existence to the songs, dances and traditions of our forefathers and their ancient folklore that otherwise may have been lost. This is achieved through our recognition of the existence the many identifiable and diverse ethnographic and ethnic groups within and beyond Poland’s borders (i.e. the folklore of the Czadeckie Highlanders-Poles living in Romania, Roma – Cyganskie, Chelm, Leczyce, Szczyrzyce, Orawa, Pszczyna, Spisz, Wilamowice, Jasliska and Lasowiaks). Mr. Zdybał’s recent activities not only add to the expansion of our repertoire and costume collections, but also explores the diverse realms and aspects of Poland’s ornate folk heritage.